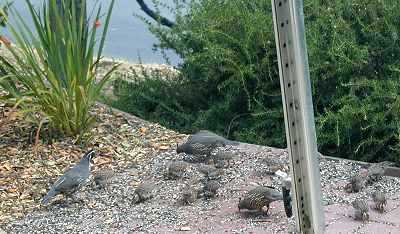 Wood Ducks, a first for Park Sierra!  This photo is not of Coarsegold! 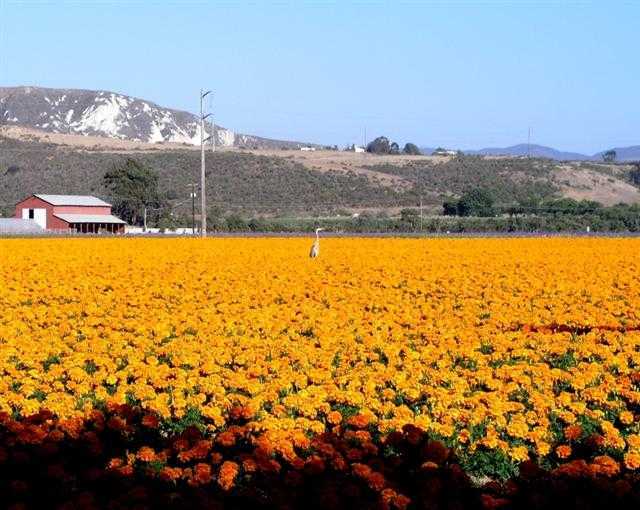 Humphrey took this shot near Lompoc. Check out the bird in the middle of the marigolds. You could say this Great Blue Heron is out standing in its field. This bird had injuries severe enough that it could not fly, and took refuge on a neighbor's porch. The owl family's three young had just fledged, and all the other owls gathered with this one for a day or two. Eventually, this owl made its way to the edge of Oak Creek, but died before help could be found. The reason I think it's a male is because I heard a female calling after this bird's death. About a week or two later, I heard male-female duetting, so apparently the female found a new mate. 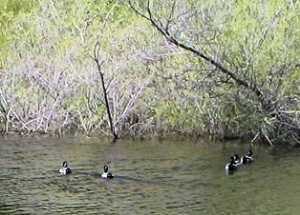 Photo on the right is of Mallards on Oak Creek's pond. 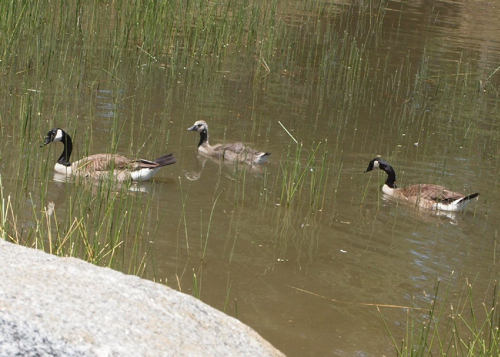 The photos below show a pair of Canada Geese with one gosling. Adults aren't uncommon, but park members say this is the first baby they've seen successfully raised at Oak Creek's pond. 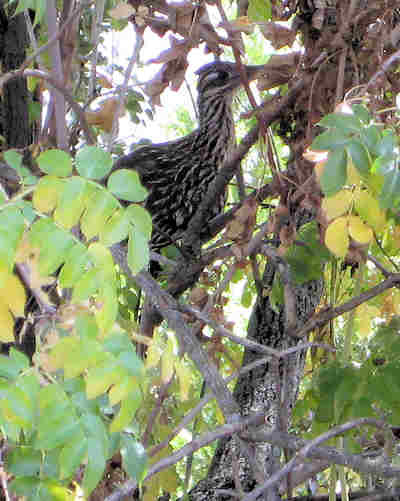 For nearly a week in July 2009, this Greater Roadrunner came by every day to Oak Creek. 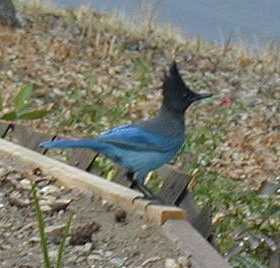 Click on the Bird List to see my Coarsegold list. light poles, or slow-moving residents. 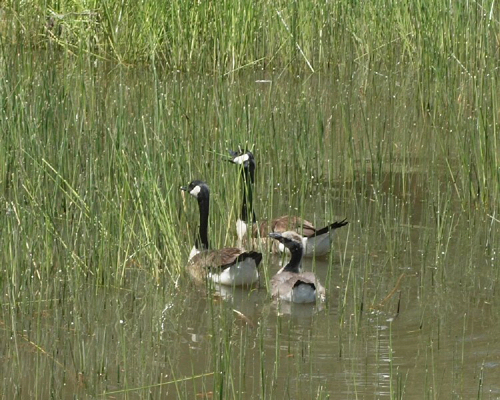 Common species include Canada goose, great horned owl, house finch, red-tailed hawk, red-shouldered hawk, sharp-shinned hawk, acorn woodpecker, Nuttall's woodpecker, northern flicker, oak titmouse, white-breasted nuthatch, bushtit, California quail, mourning dove, spotted towhee, California towhee, Anna's hummingbird, common raven, bushtit, lesser goldfinch, and western bluebird. Favorite summer residents include Bullock's oriole, black-headed grosbeak, violet-green swallow, and ash-throated flycatcher. In the winter, cedar waxwing, white-crowned sparrow, golden-crowned sparrow, dark-eyed junco, and ruby-crowned kinglet take their places. Chicks in the flock below are approximately 2 weeks old. I've been watching them since they were thimbles-on-legs. by congregating next to their mothers. which isn't bad for a couple of weeks. 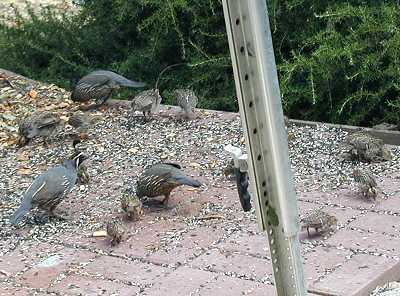 Attrition is very high for quail babies. 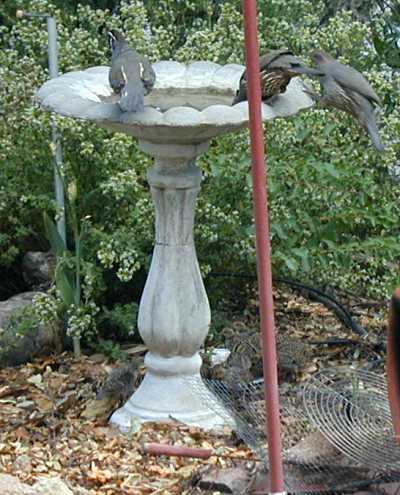 The adults drink from the birdbath, while the babies drink from a pie tin below. I have large perching rocks in the shallow tin because small chicks easily drown in deep water containers. In some years we get an influx of a particular species; in 1999 it was evening grosbeaks; other times it might be pine siskins, American robins, or hermit thrushes. 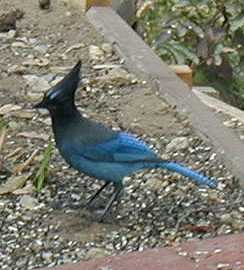 The 2003/2004 winter season brought us dozens of Steller's jays. 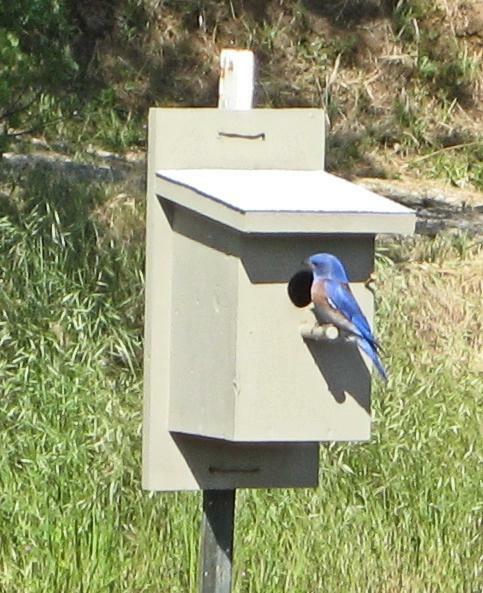 It's highly unusual to see even one at our elevation, and many of these birds stayed for months! My favorite species. 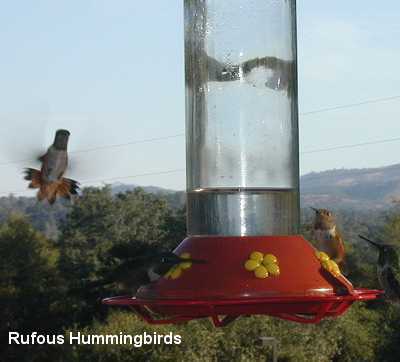 The photo at left shows Anna's hummingbirds beginning to collect at one of my three feeders for their evening feed. A few Anna's stay year-round. 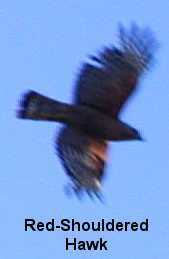 Black-Chinned are fairly regular except in winter, and in migration we have Rufous, Costa's, Calliope, and possibly Allen's. Rufous ("Copper Pennies," one of our residents calls them) are the most numerous in migration. 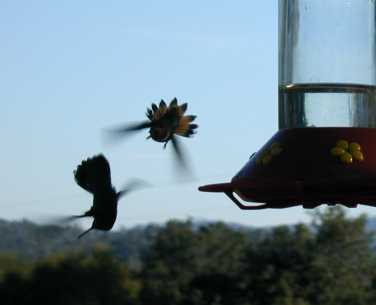 During the height of migration, the hummers can empty two quart feeders twice a day. These mighty mites usually fight fiercely for a position at the six-hole feeders, but sometimes the birds are so numerous that they give up the battle and simply share. Each feeder may have two birds at each flower hole, sipping in turn, with dozens more hovering overhead, hoping to oust them. In the photos below, take a look at the photo on the right. The leftmost bird looks upside down to me. These two photos show birds that think they are hummingbirds. 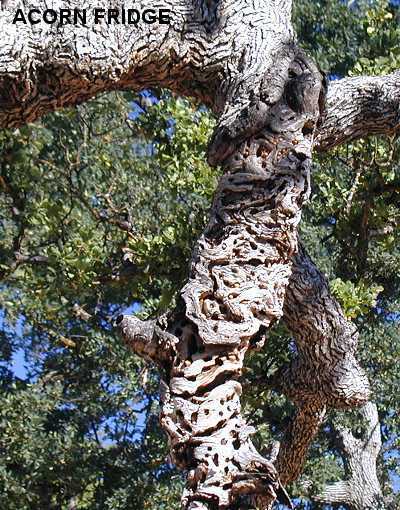 The one on the left, the Gila Woodpecker, is an Arizona specialty. Acorn Woodpeckers peck off the flowers and bee guards from my feeders to get at the sugar-water. The beauty on the right is a Bullock's Oriole, photographed in Arizona at the same location. We have them here, but I haven't been able to get a photograph yet. You just never know what you will get when you put out sugar-water!